With trumpets and drum rolls, the White House in early August released a policy paper on methods to prevent terrorism, said to have been two years in the making. Signed personally by Barack Obama and with rhetoric vaunting "the strength of communities" and the need to "enhance our understanding of the threat posed by violent extremism," the document looks anodyne. But beneath the calm lies a counter­productive–and dangerous–approach to counterterrorism. The import of this paper consists in its firm stand on the wrong side of three distinct counterterrorism debates, with the responsible Right (and a few sensible liberals) on one side, and Islamists, leftists, and multiculturalists on the other. The first debate concerns the nature of the problem. The responsible Right points to one immense threat, Islamism, a global ideological movement that has motivated some 23,000 terror attacks worldwide since 9/11. Islamists deny that their ideology spawns violence, and they categorize those 23,000 attacks as the work of criminals, crazies, or misguided Muslims. Western leftists and multiculturalists concur, bringing their formidable cadres, creativity, funds, and institutions to support the Islamists' denial of responsibility. Hearings held this year by the U.S. House of Representatives illustrate this difference. Peter King (Republican of New York), chairman of the Committee on Homeland Security, insisted on dealing exclusively with radicalization of Muslims. The ranking Democrat, Bennie Thompson of Mississippi, took exception, noting that "there are a variety of domestic extremist groups more prevalent in the United States than Islamic extremists, including neo-Nazis, environmental extremists, anti-tax groups, and others." He requested that the hearings be "a broad-based examination of domestic extremist groups, regardless of their respective ideological underpinnings." King rejected this request, countering that "While there have been extremist groups and random acts of political violence throughout our history, the al Qaeda attacks of 9/11 and the ongoing threat to our nation from Islamic jihad were uniquely diabolical and threatening to America's security." 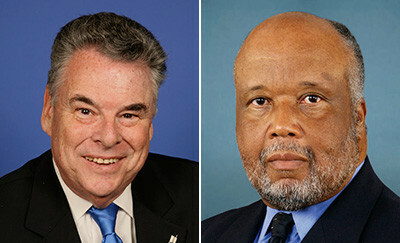 Peter King (left) and Bennie Thompson (right) symbolize the difference in counterterrorism policy outlook. The second debate concerns how to identify the enemy. The Right and responsible parties generally talk about Islamism, jihad, and terrorism; thus, a New York Police Department report from 2007, Radicalization in the West: The Homegrown Threat, refers in its first line to the "threat from Islamic-based terrorism." Islamists and their allies talk about everything else – violent extremism, Al-Qaeda and Associated Networks (dubbed AQAN), overseas contingency operation, man-caused disasters, and (my favorite) a "global struggle for security and progress." The forces of multiculturalism have made deep inroads: A U.S. Department of Defense inquiry looked into the 2009 Ft. Hood rampage by Maj. Nidal Hasan, killing 14, and its report, Protecting the Force, never mentioned the terrorist's name or acknowledged his obvious Islamist motivation. The third debate concerns the appropriate response. The Islamist-Left-multicultural crowd finds the solution in partnership with Muslims, together with an emphasis on civil rights, due process, lack of discrimination, goodwill, and avoiding a backlash. The responsible Right agrees with these goals but views them as ancillary to the full quiver of military and law enforcement methods, such as intelligence gathering, arrests, long detentions, renditions, deportation, prosecution, and incarceration. Into these three debates waddles a 4,600-word, poorly-written, ill-organized White House report vehemently advocating the Islamist/Leftist/multiculturalist position. Nature of the problem? "neo-Nazis and other anti-Semitic hate groups, racial supremacists, and international and domestic terrorist groups." Name the enemy? The paper itself never mentions Islamism. 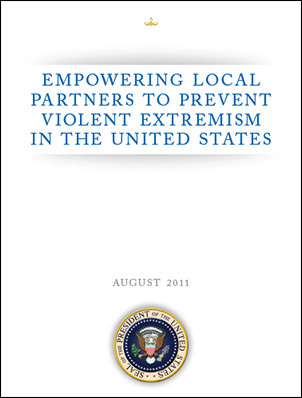 Its title, Empowering Local Partners to Prevent Violent Extremism in the United States, avoids even mentioning terrorism. Appropriate response? "Just as we respond to community safety issues [such as gang violence, school shootings, drugs, and hate crimes] through partnerships and networks of government officials, Mayor's offices, law enforcement, community organizations, and private sector actors, so must we address radicalization to violence and terrorist recruitment through similar relationships and by leveraging some of the same tools and solutions." Raising community safety issues reveals a severe conceptual deficiency which the Los Angeles Times dismissed as "implausible." The report praises the Justice Department's "Comprehensive Gang Model," deeming it a flexible framework that "has reduced serious gang-related crimes." Great news in the battle against gangs! But gangs are criminal enterprises and Islamist violence is ideological warfare. Gang members are hoodlums, Islamists are zealots. To compare them distorts the problem at hand. Yes, they both deploy violence, but applying techniques from one to the other is akin to asking pastry cooks to advise firefighters. The lone sentence in Empowering that recognizes the danger of Islamism fixates on one small group, stating that "al-Qa'ida and its affiliates and adherents represent the preeminent terrorist threat to our country." This ignores the 99 percent of the Islamist movement unconnected to Al-Qaeda, such as the Wahhabi movement, the Muslim Brotherhood, Hizb ut-Tahrir, the Iranian government, Hamas, Hizbullah, Jamaat ul-Fuqra, not to speak of so-called lone wolves. Rep. Sue Myrick (Republican of North Carolina) rightly notes that the policy paper "raises more questions … than it answers." The intellectual roots of Empowered go back to a George Soros-funded 2004 initiative, the Promising Practices Guide: Developing Partnerships Between Law Enforcement and American Muslim, Arab, and Sikh Communities by Deborah A. Ramirez, Sasha Cohen O'Connell and Rabia Zafar. These authors made their outlook clear: "The most dangerous threats in this war [on terrorism] are rooted in the successful propagation of anger and fear directed at unfamiliar cultures and people." The most dangerous threat, they announced, is not Islamist terror, with its thousands of fatalities, but a supposed widespread bias by Americans against minorities. As I observed in 2004, "The guide might present itself as an aide to counterterrorism but its real purpose is to deflect attention from national security to the privileging of select communities." While the document unobjectionably emphasizes American constitutional values and the need to partner with Muslims, it says not a word about the need to distinguish between Islamist and anti-Islamist Muslims. Empowering finesses the dismal fact that Islamists dominate the organized American Muslim leadership and their objectives share more with terrorists than counterterrorists. Rep. King correctly worries that the White House document condemns "legitimate criticism of certain radical organizations or elements of the Muslim-American community," something urgently needed to distinguish foe from friend. Indeed, the Obama administration's willingness to partner with Muslims who reject the Constitutional order accounts for Islamist organizations' delighted responses to this paper. The Council on American-Islamic Relations, a terrorist-supporting front organization, praised it as "objective and holistic," while the likeminded Muslim Public Affairs Council deemed it "very useful." In contrast, Melvin Bledsoe, father of a convert to Islam, Carlos Bledsoe, who in 2009 shot and killed a soldier at a military-recruiting center in Little Rock, Ark., said of the report: "It's never going to fix the problem when they're trying to dance around the issues." Ed Husain of the Council on Foreign Relations dismissed it for saying "worryingly little" and being primarily designed "not to offend Muslims." In brief, an organization connected to terrorists swoons over the administration's pretend counterterrorism policy while the grieving father of a terrorist scornfully dismisses it. That tells us everything. What now, with the enshrining of a fringe study as national policy? There are no shortcuts: Those who want a genuine counterterrorism policy must work to remove the Left and the multiculturalists from government. Dec. 8, 2011 update: More mush from the wimp; the White House has issued a 21-page document, "Strategic Implementation Plan for Empowering Local Partners to Prevent Violent Extremism in the United States," and it's an Islamist's dream document. The first sentence captures its spirit: "Law enforcement and government officials for decades have understood the critical importance of building relationships, based on trust, with the communities they serve." The only reference to Islam or Muslims: "As President Obama emphasized, when discussing Muslim Americans in the context of al-Qa'ida's attempts to divide us, 'we don't differentiate between them and us. It's just us'." Related Topics: Counter-terrorism, US policy | Daniel Pipes receive the latest by email: subscribe to the free mef mailing list This text may be reposted or forwarded so long as it is presented as an integral whole with complete and accurate information provided about its author, date, place of publication, and original URL.